"Madame Ernestine Schumann-Heink's 1934 Gerber Baby Food Radio Broadcasts highlight this BelAge CD. In her twilight years at the time of these sessions, she still has the vocal power and flexibility she possessed as a younger artist! The great bonus of the set is the inclusion of 6 earlier selections from her opera repertoire transferred from RCA Red Seal recordings. The grand diva speaks to her audience and those who are familiar with her will treasure this collection. These radio recordings are more clearly reproduced than on the earlier Pelican LP 'Mme Schumann-Heink On The Air' and the Victor recordings also lack the usual hiss and surface noise of most vintage recordings. This recording offers proof of Mme. Schumann-Heink's solid vocal technique. This technique served her very well from the age of 17 until she was 72, at which time these recordings were made! This is indeed a memorable CD, if only for the 'live' recordings of Brahms' 'Wiegenlied' and 'Stille Nacht', the singer's most beloved selections, and provides the listener with over 75 minutes with one of the 20th Century's truly great singers. The Hoover Sentinels was a radio concert series which was broadcast on NBC from 1927 to 1935. The 30-minute program initially aired on Sunday evenings at 10 PM and later on Sunday afternoons at 5 PM. In 1934-35 it was in the top ten of the highest rated radio programs. The program's vocalist was contralto Ernestine Schumann-Heink, who also also did a 15-minute Sunday evening series for Gerber's baby food. When The Hoover Sentinels came to an end in 1935, the 5 PM timeslot was taken over by The General Motors Hour." “Schumann-Heink’s breakthrough into leading rôles was provided when prima donna Marie Goetze argued with the director of the Hamburg opera. He asked Ernestine to sing the title role of CARMEN, without rehearsal, which she did to great acclaim. Goetze, in a fit of pique, cancelled out of the rôle of Fides in LE PROPHETE, to be performed the following night, and was again replaced by Ernestine. Schumann-Heink replaced Goetze as Ortrud in LOHENGRIN the following evening, again without rehearsal, and was offered a ten-year contract. Goetze is perhaps best-remembered as creatrice of both rôles of Herodias and Klytämnestra. 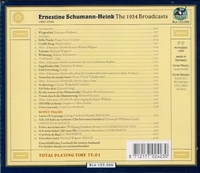 Ernestine Schumann-Heink performed with Gustav Mahler at the Royal Opera House, Covent Garden, and became well known for her performances of the works of Richard Wagner at Bayreuth, singing at the Bayreuth Festivals from 1896 to 1914. She first sang at the Metropolitan Opera in 1898, and performed with the Met regularly thereafter for decades. In 1909, she created the role of Klytämnestra in the debut of Richard Strauss' ELEKTRA, of which she said she had no high opinion, calling it 'a fearful din'. Strauss, for his part, was not entirely taken by Schumann-Heink; according to one story, during rehearsals he told the orchestra 'Louder! I can still hear Mme. Schumann-Heink!'."